YES WE HAVE MUDEYE'S AND WORMS SO BE QUICK PUT YOUR ORDER IN NOW BEFORE THEY GO!!! This years 43rd annual Yamaha / Freshwater Fishing Snowy Mountains Trout Festival will be run from Saturday the 29th of October to Friday the 4th of November 2016. The last weigh in time will be 6pm on Thursday evening. Remember all you have to do is enter this years event and attend the prize presentation to be in the draw for the Fantastic new Quintrex 390 Explorer 20hp Yamaha motor and trailer prize valued at over $10,000.00! This years competition is made possible with the continued support from Yamaha Motor Aust. who have supplied the fabulous 20hp motor in conjunction with Riverina Marine Centre Wagga Wagga, who have supplied the new Quintrex 390 Explorer boat and trailer. We thank Yamaha , Quintrex and Riverina Marine Centre Wagga Wagga for their generosity and hope that you will be able to support them in future. You also have the chance of winning $1000 worth of quality tackle for each fishing category. Our ability to make these prizes available is due to the strong support from some of Australia’s leading tackle wholesalers, EJ Todd & Son, JM Gillies, Pure Fishing, Clarkson Imports, Dunphy Sports, & Saga Tackle. Combined with the strong support from local business’s helps make this a fishing event not to be missed. 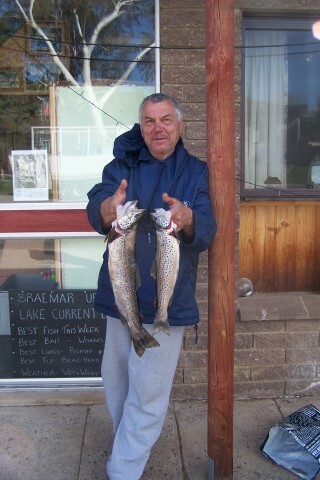 There will be daily “secret weight cash prizes” for brown trout and rainbow trout valued as much as $1000.00 each. We’re also maintaining the prize pool for the Clubs/Team Category at $1400.00 CASH !There will also be the prized Festival Beer Glasses for the largest rainbow and largest brown trout recorded at each weigh-in center. The committee hopes that you will enjoy the fishing and sites which the beautiful Snowy Mountains area has to offer, and look forward to seeing you all again. Over the last few weeks thing have been a little hard with the wind and rain all rivers have been running high and fast most die hard fishers have been getting out some with good results and others not so good. Most fish have been hugging the banks and not feeding so if you can roll a nymph down deep and close to the bank the results get better. We found if the sun is out a dry fly with a nymph dropper works well otherwise stick to the nymph fishing. Best places are, upper Eucumbene river, upper Thredbo river around the town and around Island bend. 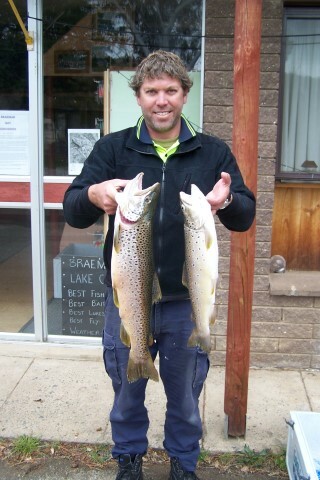 All Monaro rivers are running fast and high but fishing well. Remember practice catch and release it’s the way to go!! Overall the fishing is ok in the rivers once things calm down it will be a great season I’m sure of that. The weather earlier in the week was cold with an improving forecast for the weekend however though warmer on the weekend with a fine, calm Friday the strong winds did make conditions difficult on the weekend with only a few hardy fishers venturing out on Sunday morning. The numbers of fish caught was down on last year but this was partly due to the low numbers on Sunday due to the weather. Of concern was the decline in rainbow trout numbers this year, since 2012 the proportion of rainbow trout has been lower and the numbers did seem to be recovering slowly but this is the first year that more browns have been caught than rainbows. 53 anglers weighed in fish with 66 rainbow trout and 107 brown trout caught averaging 679 grams clean weight. The largest Rainbow Trout caught were 722 grams cleaned caught by junior Taylor Scott and Glen Zeall. Both weight fish in to the same weight. Largest Brown trout weighed 2061 grams cleaned and was caught by Chris Tyrrell, this was a deserved reward for venturing out into the wind on Sunday morning to cast lures from the bank. This was the only fish over 2 kg weighed in though of course there were many stories of bigger fish that got away. The winner is judged on the best five fish for each angler, with 10 fish allowed to be weighed in over the three days per angler. This year’s competition winner was Dave Lazzaro with five fish weighed in for a total of 6924 grams. The junior section was hotly contested as usual with 24 entrants and the winner was Lachlan Swindale with five fish weighed in at 4550 grams. Most fish were caught by trolling or lure casting with a wide range of lures working and the bait fisherman had less luck but did have some success using worms. This year’s event raised over $15500 for R.P.A Haematology Unit, Sydney for research and patient care. The event is held every October at Buckenderra Holiday Village whose generous support and wonderful hospitality is greatly appreciated by the organizers and competitors. The generosity from the fishing and boating industry is overwhelming. Taylor Scott and Glen Zeall both weight in the same weight for the largest rainbow of the weekend. Trolling has been going well on the lake with some good rainbows and browns but at times things have been a little hard with all that wind and rain but once things calm down the reports have been good. Over at Middling Bank Tassie devils and King Cobras have been doing well along with the strike pro blades. At Seven gates Tassie Devils, Rapalas, King Cobras and Crick hoppers are going well. Overall the Trolling has been good and better times to come now the weather is clearing up looks like the Snowy comp is going to be good for the trollers. Trolling the lake has been up and down but that is only to do with the weather but after the wind and rain has stopped things have improved with good results with the rainbows and browns. Best times have been around 6am to 10am but if the weather is warm and cloudy the fishing has been good all day long. Cold wet and very windy conditions once again proved to be the dominant feature of the week here at Braemar, we are so over these damn conditions, the wind has been relentless and damaging, boating has been something visitors can only dream about of late, it really has been a very wild week weather wise. In between the rain and windy some anglers were fortunate to get out for a couple of hours here and there, trolling did pick up a little bit with the Hall party from Canberra getting amongst 20 fish over this past weekend using a varity of lures including Tassie Devils, Sting and some homemade specials, darker colours once again proved more successful and best area’s included Coppermine, Power Lines and Braemar Headland, most fish were in the 1200gms to 1500gms range in about 3m of water. Chris Raymond also had some magic sessions landing 2 great Browns one morning before the wind got up, Chris trolled a variety of lures but his best results were had with a brown trout pattern Rapala, Venny Wezinow also got amongst some nice fish trolling deep near the Tolbar, again darker coloured Tassie’s worked best for him with # 103 featuring in most catches. The Sheehan gang from Victoria suffered badly as the foul weather rolled in affecting their opportunities for a considerable part of the week, but they also had some great results bait fishing and trolling when they could get out, Leo from Geelong did well before he left and Ian Davis also got amongst some great Browns and Rainbows with his best nearing the 6lb (2.68 kg mark), Brian also had some good results bait fishing and trolling on the odd occassion, worms are still the stand out method with mudeyes starting to make an impact now. Michael Ball and his brother Steve had 1 reasonable session also in poor weather conditions picking up a couple of Browns around the 1.5 kg mark on lures. Most locals report that the poor conditions actually enhanced the fishing at times with just about everyone getting a fish or 2 if they actually went out, again bait fishing from the bank is getting the results right now, fly fishing had no participants during the past week for obvious weather related conditions, but with some fine weather approaching by week’s end that method should improve one would hope, best Tassie’s of the week were # 10, # 10 # 109 and # Y82, pictured are Chris Raymond and Venny Wezinow with their fine catches.